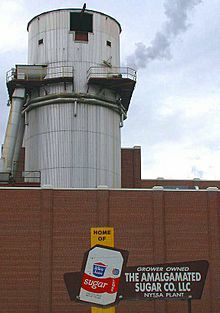 Malheur County /mælˈhɪər/ is a county located in the southeast corner of the U.S. state of Oregon. As of the 2010 census, the population was 31,313. Its county seat is Vale, and its largest city is Ontario. The county was named after the Malheur River, which runs through the county. "Malheur" is French for misfortune or tragedy. Malheur County is included in the Ontario, OR-ID Micropolitan Statistical Area, which is also included in the Boise City-Mountain Home-Ontario, ID-OR Combined Statistical Area. It is included in the eight-county definition of Eastern Oregon. According to the U.S. Census Bureau, the county has a total area of 9,930 square miles (25,700 km2), of which 9,888 square miles (25,610 km2) is land and 42 square miles (110 km2) (0.4%) is water. 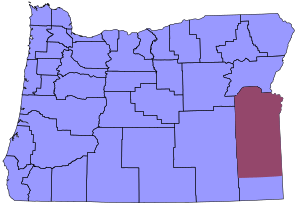 It is the second-largest county in Oregon by area. It is the only county in Oregon in the Mountain Time Zone. Most of Malheur County (shown in red) is in the Mountain Time Zone; a small portion in the southern part of the county is in the Pacific Time Zone along with the rest of the state of Oregon and neighboring Nevada. Because of its economic relationship with Idaho, most of the county is in the Mountain time zone, making it the only county in Oregon that does not completely follow Pacific Time. The largely unpopulated southern quarter of the county, near McDermitt, observes Pacific Time. The legal dividing line between the two begins at the southwest corner of township 35 S, range 37 E and continues east to the Oregon–Idaho border, crossing Highway 95 at approximately 42.45° N. latitude. (Precisely, 42 degrees, 27.166 minutes. The official Oregon sign marking the crossing is in the wrong place, about ten miles north.) Malheur is one of the few counties in the U.S. that legally observes two different time zones. 25.62% of the population were Hispanic or Latino of any race. 14.2% were of German, 10.5% English, 8.4% American and 6.9% Irish ancestry. 79.4% spoke English and 19.4% Spanish as their first language. As of the 2010 United States Census, there were 31,313 people, 10,411 households, and 7,149 families residing in the county. The population density was 3.2 inhabitants per square mile (1.2/km2). There were 11,692 housing units at an average density of 1.2 per square mile (0.46/km2). The racial makeup of the county was 77.5% white, 1.7% Asian, 1.2% American Indian, 1.2% black or African American, 0.1% Pacific islander, 15.5% from other races, and 2.9% from two or more races. Those of Hispanic or Latino origin made up 31.5% of the population. In terms of ancestry, 16.2% were German, 11.9% were English, 10.3% were Irish, and 9.9% were American. Of the 10,411 households, 34.8% had children under the age of 18 living with them, 51.6% were married couples living together, 11.8% had a female householder with no husband present, 31.3% were non-families, and 26.0% of all households were made up of individuals. The average household size was 2.69 and the average family size was 3.24. The median age was 36.2 years. The median income for a household in the county was $39,144 and the median income for a family was $46,136. Males had a median income of $33,234 versus $27,883 for females. The per capita income for the county was $16,335. About 15.2% of families and 22.7% of the population were below the poverty line, including 27.1% of those under age 18 and 10.5% of those age 65 or over. Malheur County, Oregon Facts for Kids. Kiddle Encyclopedia.